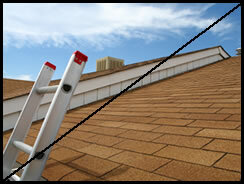 Other roofing contractors lean ladders against your house and gutters. You don’t want roofing contractors walking on your roof and tugging at the flashing, causing damage or leaks. You don’t want the liability risk if a roofing contractor falls off. And you definitely don’t want to change your schedule to be home to meet with the roofing contractor. Signature Roofing does roofing estimates differently. We use aerial photos and satellite technology for more accurate measuring and estimates. Then our roofing contractors visit for an inspection and only go on your roof if necessary. Our roofing estimates include everything—roofing material, contractor labor, permits and sales tax—so you’ll know the exact cost. A roofing contractor who stands behind his roofing work offers a comprehensive warranty. With Signature Roofing, leaks are never a problem so our warranty is extensive. Our 10-year, $5,000, fully transferable workmanship warranty is practically free of legal jargon. Our roofing contractors fix any leak at no cost and pay up to $5,000 for needed repairs to any sheetrock, painting and insulation. The shingles are covered by 40-year or lifetime manufacturer warranties. Nearly 5,000 San Mateo and Santa Clara county homeowners have chosen Signature Roofing as their roofing contractor. We’ve been in business since 1993, have the Better Business Bureau’s A+ rating, and are city and state licensed in good standing. We carry $2M in liability insurance & Workers Comp—double the roofing industry standard. A $100 deposit is all it takes to get started. Other roofing contractors require $1,000 or more as the law allows. Signature Roofing never files pre-lien notices on your home like other roofing contractors do. We mail your invoice after your roof is complete and you’re completely satisfied with our roofing contractors’ work. See some of our recent roofing projects, download our comprehensive Roofing Process Guide or request a FREE roofing estimate today!